Mathhi or mathri used to be one of my most favourite tea time snack when I was younger and could eat whatever I wished. I used to fry mathhis by the kilo and always keep them handy. All types of spiced, herbed and plain or salted mathhis were made at the drop of a hat. Cookies were not my thing. In fact this one is an all time favorite tea time snack of north Indians, it is definitely high on calories and made with refined flour and a lot of oil or ghee. But the taste is irresistible, you eat one with your tea and then you want one more after the tea. This is how Mathhi is. 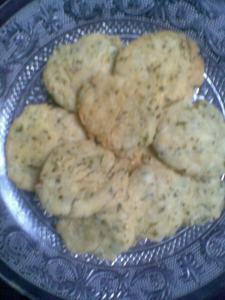 Essentially a fried savoury short pastry, mathhi makes cookies run for their money. Mathhi or mathri is a traditional savory snack and is available in many versions now a days in Banaras sweet shops and bakeries. Masala mathhi, methi mathhi, kali mirch mathhi and so on. Earlier only plain mathhi was available, somehow we are getting more adventurous regarding food all over the world.. When I was younger I used to love experimenting with food. Though I still experiment but when I was young it was considered very unusual in my family and friends as I used to come up with strange looking things. This dhaniye wali mathhi was one of those experiments. Once while making mathhi I just thought that coriander would be a good flavor for mathhi. Those days only methi (fenugreek) was the other flavor available and somehow I disliked the slightly bitter taste when more methi was used. There was no flavour at all when lesser quantity of methi was used. You know what I mean. Mix maida with salt and 1/2 cup ghee well till it resembles bread crumbs, add all the other ingredients and some water slowly while mixing with the other hand. The dough should be tight and not very smooth. This way the mathhi will have rough ends and be more crisp and layered. After binding the dough make small portions of it to make small balls and flatten them with hands or with a rolling pin. Keep it thick like cookies. Make holes in them to prevent them from fluffing up like puris. Make such roundels from all the dough and deep fry till pinkish brown and aromatic. Use a slotted spoon to fish out the fired mathhis from hot ghee and cool down. Keep in airtight container when completely cool. Keeps well for a month. Yam Kebab sounds very interesting Sangeeta...wish you publish ur recipe soon, its very tempting to me. Yeah mortar and pestle right...clay made/stone made will work for it.